GW4064 represses CYP3A4 expression. Primary human hepatocytes (HH) from three different donors were treated with vehicle (DMSO) or GW4064 (1 μM) for 48 hours in triplicate. RNAs were collected, and mRNA levels of CYP3A4 (A) and SHP (D) were determined by using qRT-PCR. (B) CYP3A4 activity was measured in S9 fractions from the GW4064- or vehicle-treated hepatocytes using midazolam as a probe substrate. Data shown are production rates of hydroxymidazolam in pmol/h per milligram of protein. (C) HepG2 cells were cotransfected with pGL3-CYP3A4 and Renilla luciferase vector. On the next day, the cells were treated with vehicle (DMSO) or GW4064 (1 μM) for 24 hours, and dual luciferase assays were performed. (E) Primary human hepatocytes were treated with vehicle (DMSO) or cholic acid (50 μM) for 48 hours in triplicate. RNAs were collected to measure CYP3A4 and SHP mRNA expression by qRT-PCR. (F) HEK293T cells were cotransfected with pGL2-SHP and Renilla luciferase vectors, along with FXR and RXR expression vectors. On the next day, the cells were treated with vehicle (DMSO) or GW4064 (0.1, 1, 10, 100, 1000, or 10,000 nM) for 24 hours, and dual luciferase assays were performed. NS, not significant. Data shown are mean ± S.D. *P < 0.05; **P < 0.01; ***P < 0.001 versus vehicle-treated group. 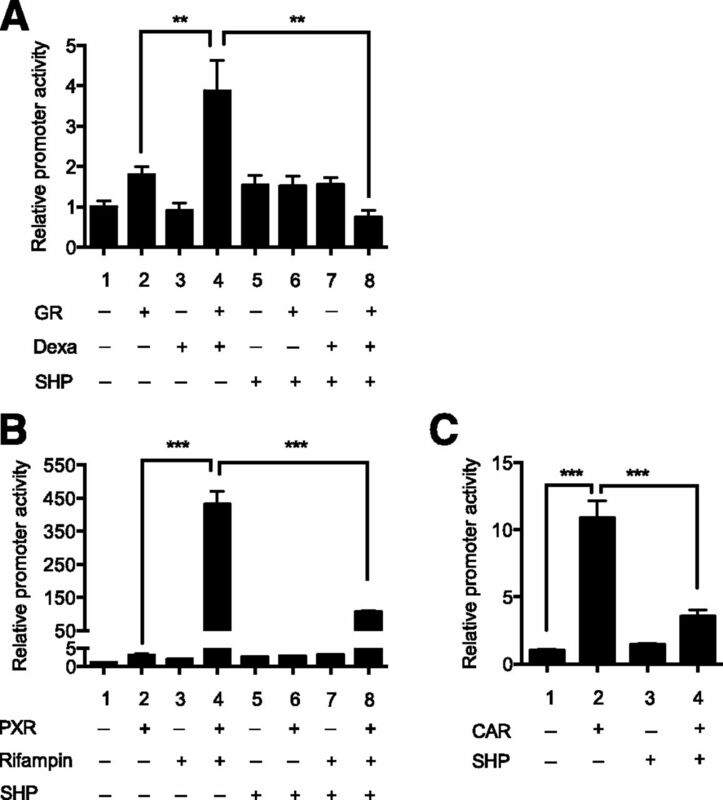 SHP represses PXR and CAR transactivation of CYP3A4 promoter. (A) HepG2 cells were cotransfected with pGL3-CYP3A4 and Renilla luciferase vector, along with expression vectors for GR or SHP. On the next day, the cells were treated with vehicle (DMSO) or dexamethasone (1 μM) for 24 hours, and dual luciferase assays were performed. (B) HepG2 cells were cotransfected with pGL3-CYP3A4 and Renilla luciferase vector, along with expression vectors for PXR or SHP. On the next day, the cells were treated with vehicle (DMSO) or rifampin (5 μM) for 24 hours, and dual luciferase assays were performed. (C) HepG2 cells were cotransfected with pGL3-CYP3A4 and Renilla luciferase vector, along with expression vectors for CAR or SHP. The cell lysates were collected after 24 hours, and dual luciferase assays were performed. **P < 0.01; ***P < 0.001. GW4064 upregulates CYP2B6 expression via FXR. (A) Primary human hepatocytes from three different donors were treated with vehicle (DMSO) or GW4064 (1 μM) for 48 hours in triplicate. RNA was collected, and CYP2B6 mRNA expression level was measured by using qRT-PCR. (B) HepG2 cells were cotransfected with pGL3-CYP2B6 and Renilla vector and treated with vehicle or GW4064 (1 μM), and dual luciferase assay was performed. (C) HEK293T cells were cotransfected with pGL3-CYP2B6 (or pGL2-SHP) and Renilla vector, along with FXR and RXR expression vectors. On the next day, the cells were treated with vehicle (DMSO) or GW4064 (1 μM). The cell lysates were collected after 24 hours, and dual luciferase assays were performed. **P < 0.01; ***P < 0.001. Differential regulation of CYP2B6 and CYP3A4 by GW4064. 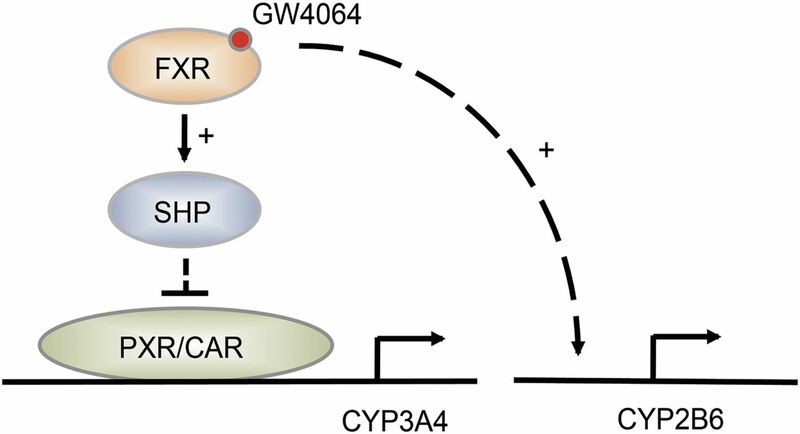 FXR activation by GW4046 leads to decreased CYP3A4 expression, potentially through SHP upregulation and subsequent repression of PXR and CAR transactivation of CYP3A4 promoter. On the other hand, GW4064 enhances CYP2B6 promoter activity.